FILE PHOTO: A gathering of indigenous people at a Boise park. Quarry View Park and Castle Rock Reserve could be getting new names. 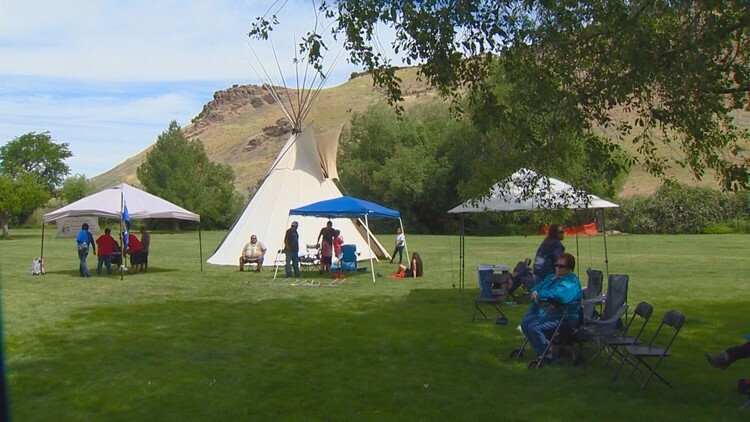 BOISE, Idaho — An effort is underway to rename a Boise city park and reserve to honor indigenous people in the Boise Valley. Staff members with the Arts & History and Parks and Recreation departments are recommending that Quarry View Park be renamed Eagle Rock Park and that Castle Rock Reserve be renamed Chief Eagle Eye Reserve. About a half dozen tribes were the original inhabitants of the Boise Valley. The tribes call the balancing rock above Quarry View Park “Eagle Rock” and say it has great significance to their people. Many of their ancestors are buried in the surrounding hills. Chief Eagle Eye was the leader of a peaceful band of Weiser Shoshone. In 1878 they refused to relocate to reservations and instead lived quietly in the Idaho mountains for two decades. Chief Eagle Eye died in 1896 and is buried at the top of Timber Butte, overlooking his homeland. A public hearing on the proposal is scheduled Thursday, April 18, before the Boise Parks and Recreation Commission. The meeting starts at 4 p.m. in the Maryanne Jordan Council Chambers on the third floor of City Hall.